My day began with a minor disaster—and a lesson: don’t attempt to separate eggs without being properly caffeinated first. After 5 wasted eggs and 2 cups of coffee, I successfully separated nine eggs and made an angel food cake for my father. Instead of orecchiette, I used conchiglie rigate (ridged shells), a sturdy pasta that holds up to reheating and even better—has the perfect concave shape to trap bits of sausage and sauce, so the all the flavors really get into the pasta. Before preparing a container of this lovely dish for a surprise delivery, I stole a few bites. (Okay, more than a few.) I think my boyfriend will be happy. So after making a cake for dad and pasta for my boyfriend, it was time to make something for myself. On chilly & rainy days like today, the only thing I want is soup. 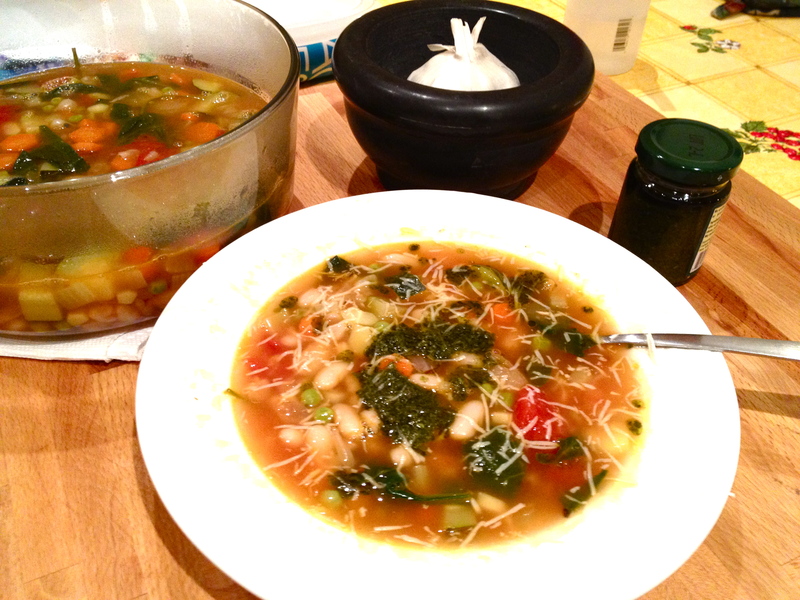 I cooked some beans, gathered and chopped my veggies, and defrosted my chicken stock—all the makings of a hearty soup. But I wanted a little something extra. Not heat or spice or meat, but a something fresh with a nice pop. Enter pesto. A little bit of pesto sauce does what dried herbs cannot do—add the sweet zing of fresh basil, garlic & extra virgin olive oil in one concentrated shot. Plus, it turns average soup into something fancy-sounding: Soup al Pistou. Oui! Heat a large pot over medium high heat. Add oil, swirl to coat. Next, add carrots, celery, garlic and 1 teaspoon salt. Cook, stirring occasionally, for about 10 minutes, or until the vegetables are soft. Add chicken stock, raise the heat and bring the mixture to a boil. Stir in beans, peas, zucchini, and tomato. Allow mixture to cook at a rapid simmer (you don’t want a rolling boil) for another 10 minutes. Add spinach, stirring into the soup until it’s wilted. Remove the pot from the heat, add the other teaspoon of salt and freshly ground pepper to your taste. Divide soup into 4 bowls. Spoon a heaping teaspoon of pesto on top of each bowl, following with the grated cheese. Have a seat, a sip of wine, and stir up your soup. Enjoy with a piece of warm, crusty bread. Voi-la! Note – If you’re dining alone like me, and want to save the rest of the soup for lunch and dinner during the week, refrigerate the soup (without the pesto or cheese) within two hours of cooking. It’ll keep for 4-5 days. Add the pesto and grated cheese when you reheat the soup. 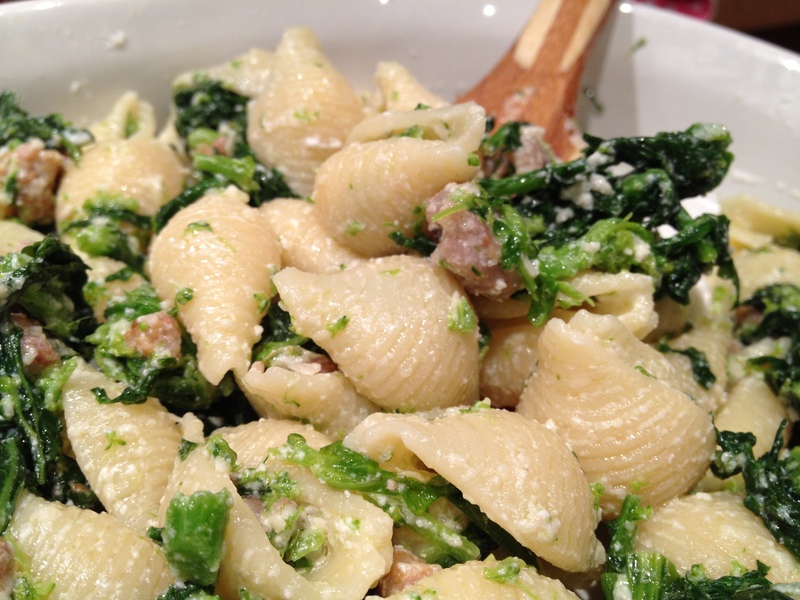 This entry was posted in Musings, Recipes, Savory and tagged al pistou, broccoli rabe, david tanis, easy, light, oricchiette al forno, pasta, pesto, photos, points plus, quick, recipes, sausage, soup, sunday cooking, vegetables, weight watchers. Bookmark the permalink. So true–it’ good to have a magic sauce! 🙂 I just got two David Tanis cookbooks out of the library and I am looking forward to looking through them. Looking through “Heart of the Artichoke” was what prompted me to add “Platter of Figs” to my wish list for Christmas last year. The pictures are gorgeous, and the food doesn’t look oiled, waxed, glued or airbrushed – it looks like someone made it, and that’s what attracted it. Looking through both those books makes me so hungry! The only issue I find it that unlike Tanis, I rarely find myself cooking for groups of 8-10 people, which means carefully breaking down the recipes and dividing ingredients. Still, both books are excellent sources of inspiration.